Maude Elizabeth Kee made history as West Virginia’s first woman Member of Congress and as a critical part of that state’s Kee family dynasty in the U.S. House, stretching from the start of the New Deal to the Watergate Era. 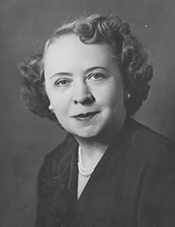 Succeeding her late husband, John Kee, in 1951, Elizabeth Kee went on to chair the Veterans’ Affairs Subcommittee on Veterans’ Hospitals and became a leading advocate for the coal–mining industry, a major employer in her district. When she left Congress in 1965, her son, James, won her seat, accounting for one of a handful of father–mother–son combinations in Congress. Maude Etta “Elizabeth” Simpkins was born in Radford, Virginia, on June 7, 1895, the seventh of 11 children born to John Jesse Wade Simpkins and Cora French Hall Simpkins. Her father was a policeman and a railway company employee before moving into real estate and resettling the family in Roanoke, Virginia. Raised in a conservative Republican, Baptist household, she quickly challenged her parents’ politics and religion. Her siblings later recalled that she converted to Catholicism and became a Democrat, “as soon as she was old enough.”1 She attended the National Business College and, during World War I, took her first job as a secretary for the business office of the Roanoke Times and, later, as a court reporter for a law firm. Elizabeth Simpkins married James Alan Frazier, a railway clerk. They had three children: Frances, James, and a child who died in infancy. The marriage soon fell apart, and James Frazier’s attorney during the divorce was John Kee, who fell in love with Elizabeth. In 1925 she moved to Bluefield and, a year later, she married him.2 John Kee was elected to the 73rd Congress (1933–1935) in the 1932 Roosevelt landslide, as a Democrat from a southeastern West Virginia district. Elizabeth Kee served as his executive secretary throughout his congressional career, including his service after 1949 as chairman of the Committee on Foreign Affairs.3 She once described her job on Capitol Hill as “being all things to all constituents,” a combination of “clergyman, lawyer, psychiatrist and family friend.”4 Meanwhile, Kee authored “Washington Tidbits,” a weekly column that was syndicated to West Virginia newspapers. Representing the second largest coal–producing district in the country, Kee became a major advocate for coal miners and related businesses. West Virginia mines accounted for about one–third of the national output by 1957.16 But the industry suffered heavily from foreign fossil fuel competition and, for much of the 1950s, recession plagued the state economy. Throughout her time in the House, Kee repeatedly defended U.S. coal operations from foreign energy imports, particularly “residual” (heating) fuel oil from South America and natural gas from Canada. “We do not intend to stand idly by and see American workers thrown out of employment by unnecessary concessions to foreign countries,” Kee declared.17 Congresswoman Kee addressed this issue, often casting it as a threat to U.S. national security because it took away American jobs and made the country reliant on imports of critical materials. “If we are to be prudent in our efforts to safeguard the basic security of our country, our own self–preservation, then the Congress of the United States must, now, face up to its responsibility and pass legislation to protect in a fair and just manner our own basic coal industry,” she said in a floor speech.18 Still, Kee could do little to stanch the flow of foreign oil into the U.S. market. In 1964, Kee declined to seek an eighth term in the House due to poor health.23 Her son and longtime administrative assistant, James, won the Democratic nomination. That November, when he won easy election with 70 percent of the vote, Maude Kee became the first woman in Congress to be succeeded directly by one of her children. From 1933 to James Kee’s retirement, when the district was reapportioned out of existence prior to the 1972 elections, the Kee family represented West Virginia in the House. Elizabeth Kee retired to Bluefield, where she died on February 15, 1975. 1William H. Hardin, “Elizabeth Kee: West Virginia’s First Woman in Congress,” West Virginia History 45 (1984): 109–123; quotes pp. 109–110. 4Hope Chamberlin, A Minority of Members: Women in the U.S. Congress (New York: Praeger, 1973): 226; Genevieve Reynolds, “Congressional Capers,” 28 August 1949, Washington Post: S3. 5“Mrs. Kee Willing to Run,” 13 May 1951, New York Times: 61. 6“Grandmother Runs for Seat in Congress,” 22 July 1951, New York Times: 45; this is a story on Vera Buchanan in which Kee is mentioned. See also, Hardin, “Elizabeth Kee”: 109–123; and Michael Dubin et al., U.S. Congressional Elections, 1788–1997 (Jefferson, NC: McFarland & Company, Inc., Publishers, 1998): 585. 7“Taking Her Husband’s Place in Congress,” 27 July 1951, New York Times: 19. 8“Mrs. Kee to File for Renomination to Seat in House,” 5 January 1952, Washington Post: 12. 9“Election Statistics, 1920 to Present,” http://clerk.house.gov/member_info/electionInfo/index.aspx. 10Chamberlin, A Minority of Members: 226. 12Current Biography, 1954 (New York: H.W. Wilson and Company, 1954): 370–371; Congressional Record, House, 87th Cong., 1st sess. (27 February 1961): 2743. 15Congressional Record, House, 85th Cong., 2nd sess. (25 February 1958): 2804; Congressional Record, House, 84th Cong., 2nd sess. (19 April 1956): 6708–6709. 16Congressional Record, House, 85th Cong., 1st sess. (1 April 1957): 4953–4954. 17Congressional Record, House, 83rd Cong., 2nd sess. (28 January 1954): 975; Congressional Record, House, 85th Cong., 1st sess. (3 June 1957): 8276–8277. 18Congressional Record, House, 83rd Cong., 2nd sess. (28 June 1954): 9115; Congressional Record, House, 87th Cong., 1st sess. (18 August 1961): 16333; Congressional Record, House, 87th Cong., 2nd sess. (29 March 1962): 5504; Congressional Record, House, 85th Cong., 2nd sess. (17 June 1958): 11546–11547. 19Hardin, “Elizabeth Kee”: 121; see also, Congressional Record, House, 85th Cong., 1st sess. (18 July 1957): 12116. 22Congressional Record, House, 85th Cong., 1st sess. (23 May 1957): 7598. 23“Rep. Kee Retiring at End of Term,” 5 January 1964, Washington Post: A4. Papers: In the correspondence of James and Elizabeth Kee, 1963-1966, 13 feet. The collection contains correspondence between Maude Elizabeth and her son James Kee. A finding aid is available in the repository. Hardin, William H. "Elizabeth Kee: West Virginia's First Woman in Congress." West Virginia History 45 (1984): 109-23. Heywood, Shari A. "Elizabeth Kee: A Clarion Voice of and for the People of Southern West Virginia." M. A. thesis, Marshall University, 2006. "Maude Elizabeth Kee" in Women in Congress, 1917-2006. Prepared under the direction of the Committee on House Administration by the Office of History & Preservation, U.S. House of Representatives. Washington: Government Printing Office, 2006.